More details on Penumbra and Symbiosis. Amplitude has announced details and released trailers for the Endless Space 2 and Endless Legend Penumbra and Symbiosis expansions. They're both out next week. "10 months ago, we started out on a journey to co-create the Umbral Choir faction with our community. We held a series of votes on everything from species origin, morphology, nomenclature, ship structure, lore & much more…. This series of 11 community votes helped us create the badass spectral faction we’ve arrived at today, which looks unlike all the factions we’ve created before. Thank you to everyone who contributed!" In addition to the new faction, hacking and invisibility will also be introduced. You'll be able to attempt to hack into others' home systems, regardless of the faction you're playing. Invisibility modules for ships will also be introduced, allowing you to hide from enemy view, though detection modules to counter them will also be available. 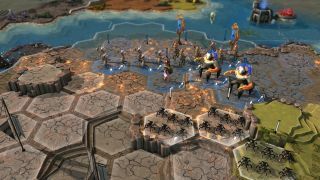 Symbiosis, meanwhile, will be Endless Legend's last expansion, over four years after the game originally launched. Amplitude has teamed up with NGD Studios again for the this one (they previously worked together on the Inferno expansion), which will see the introduction of a new faction, the Mykara, and new tameable beasts, the Urkan. You can see both the Mykara and Urkans in action in the trailer below. Both Penumbra and Symbiosis expansions are available for pre-order now at a base price of $12.99/£10.99, though both are available with an additional ten percent off on Steam. And if you're interested in owning both, you'll nab a 20 percent discount if you purchase them together. Endless Space 2: Penumbra and Endless Legend: Symbiosis are set for release next week on January 24.